Your two hearts beat as one just like the divine combination of highly polished white gold and shimmering Diamond solitaires joined together in this fabulous design. Set in 14 Karat white gold; one polished heart flows in gold, intertwined with a second heart climbing over the first made up of 18 shimmering white Diamond solitaires. Twinkling, with 0.75 Carat t.w. 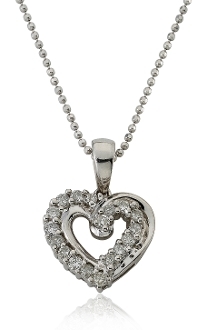 of Diamonds and finished with a high polished shine, this double Diamond heart pendant hangs close to your heart along a 16 inch Diamond cut ball chain that secures with a lobster claw clasp. Linked forever in a sparkling embrace, this double heart pendant is a reflection of your love.